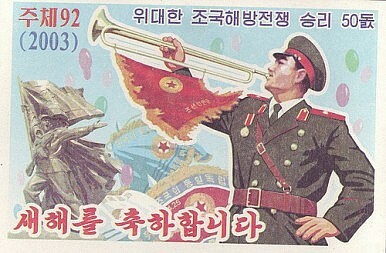 North Korea has used Photoshop to humorous effect in its military propaganda crusade. When Agence France Presse (AFP) photo editor Eric Baradat took a closer look at a photo of hovercraft engaged in a military exercise released by North Korea’s Korean Central News Agency (KCNA), evidence of “excessive digital alteration” leapt out at him. Tell-tale signs of image doctoring (seen here) include the identical shine of the vessels (digital twins as The Atlantic’s Alan Taylor called them), combined with their movement through the water at the same angle, whipping up shoddily manipulated spray along the way. “Usually a very simple examination with our software dismisses KCNA pictures but they tend to be better with Photoshop recently,” Baradat told The Telegraph. These images were released by KCNA amid a propaganda push in which Kim Jong-un warned that nuclear war was a real possibility on the Korean peninsula. “Under the situation where a war may break out any moment, there is no need to keep up North-South military communications,” the KCNA quoted a senior North Korean military official as telling South Korea before the North severed a Red Cross hotline and another used for communicating with the UN Command based at Panmunjom in the Demilitarized Zone between the two neighbors. “They are upping the rhetorical ante in every possible way, but the international community is not reacting as it had hoped,” said analyst Cho Han-Bum from the Korea Institute for National Unification. But North Korea’s bungled Photoshop campaign is only the most recent in a string of international stunts that have proved to be more folly than threat in the end. From Iran and the Philippines to China and even Canada, official attempts to spruce up images have backfired on many accounts. In perhaps the most famous instance, Chinese officials seem to be levitating above a road they are supposedly “inspecting,” which generated a meme. Other classics include an image of Russian opposition leader Alexei Navalny chumming up alongside corrupt Russian oligarch Boris Berezovsky, both of them all smiles; as well as the snapshot of Canadian MP Rathika Sitsabaitesen in which her neckline has been raised to conceal her cleavage. All of these and other epic Photoshop gaffes can be seen here.